This article focuses on the scientific study of quality of life in old age and summarises, on the one hand, what we know and, on the other, what further research is needed. It consists of three main parts, with an extended introduction charting the recent evolution of a European perspective on ageing. First of all, it emphasises the amorphous, multidimensional and complex nature of quality of life and the high level of inconsistency between scientists in their approach to this subject. Secondly, the article summarises the main areas of consensus about quality of life in old age—its dynamic multifaceted nature, the combination of life course and immediate influences, the similarities and differences in the factors determining quality of life between younger and older people, the most common associations with quality of life and the likely variations between groups, and the powerful role of subjective self-assessment. Thirdly, the main research priorities and gaps in knowledge are outlined, together with the key methodological issues which must be tackled if comparative, interdisciplinary research on quality of life is to develop further. 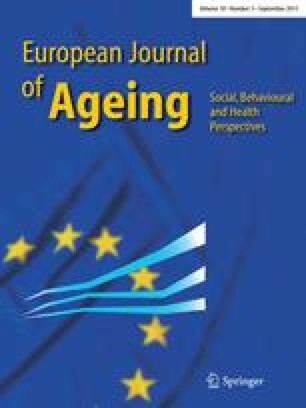 The main sources for the article are two European Framework Programme projects—the one a small five-country comparison and the other a large multidimensional project which, among other things, has been developing recommendations for research on quality of life in old age and included an extensive literature review on this topic. The article also draws on the recently completed UK Growing Older Programme of research on extending quality of life. This article was previously published with DOI s10433-005-0015-8, which was mistakenly created twice and has therefore been replaced by the current DOI. I would like to thank very warmly the following for their help with this paper: Ann Bowling, Joe Cook, Rocio Fernández-Ballesteros, the EJA’s anonymous referees, and all of the participants in the FORUM project quality of life workshops.